When are park and recreation improvements coming to my neighborhood? Small fixes like broken sprinklers or playground equipment can be reported through pocketgov.com for immediate review from our operations team. Larger projects like playground and court upgrades take longer to complete. Every quarter, planning and park operations management meet to look at department's improvement requests and maintenance reports, using several factors to determine levels of need and priorities throughout the city's 250+ parksand 29 recreation centers. How are new projects and upgrades in parks and recreation centers prioritized? Improvements and upgrades are decided on through the Capital Improvement Project (CIP) process: Each quarter, park operations & planning management reviews the list of inquiries and reports that have come in via pocketgov.com or Denver 311 (720-913-1311). From there, repairs and upgrades are prioritized based on multiple factors such as safety issues, available resources, location and other current projects going on in the area. Project scope is also considered—sometimes short-term repairs are not completed right away to save resources if a more extensive replacement or upgrade is ultimately needed. Can I ride electric scooters or bicycles on off-street trails? Motorized vehicles are defined as any vehicle, device, or trailer (whether or not attached to a motorized vehicle) including but not limited to an automobile, truck, van, sports utility vehicle, recreational vehicle, motorcycle, motor scooter or bike. The regulation of such devices is important to the safe and harmonious public use of park facilities. City and County of Denver staff are actively working to evaluate current ordinance language and determine the best location for users to operate these types of toy vehicles in the public right-of-way in order to maintain both public safety and infrastructure. Safety for all users of our transportation network is of utmost priority as we review options and evaluate the pilot program. Learn more about Denver’s policies regarding dockless electric scooters and bikes, including general guidelines for users of these amenities. With the responsibility for keeping the parks and facilities of in the best condition for visitor use, the Department must continually maintain, upgrade, and replace its park landscape and facility improvements. At any given time, there are dozens of park design and construction projects in progress to maintain, improve, and expand the park system. The Capital Projects staff consists of skilled project managers that assemble design teams, prepare design and construction documents, competitively bid and oversee the site construction process. To gather public feedback and improve planning and design processes, online surveys are open periodically. Plans for a pocket park at 29th and Fairfax are being developed with input from the community. Public engagement will continue through April 2019 with construction is anticipated to begin early 2020. Find details below on how to provide input, along with project background information and community outreach materials. Provide feedback on preferred concept designs! Join Denver Parks & Recreation and the Stakeholder Design Committee for the FINAL open house regarding plans for the park at 29th & Fairfax. All are welcome! Contact SignLanguageServices@denvergov.org. For any other public accommodation requests/concerns contact DisabilityAccess@denvergov.org. Learn more about the redesign of City Park Golf Course. Join DPR for the unveiling of the preferred concept for Dustin Redd Playground! This is a an opportunity for the community to provide final input on the design. 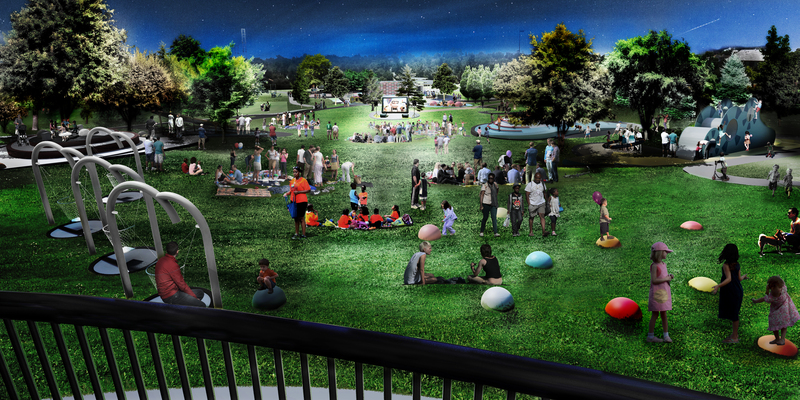 Dustin Redd concept design will include the playground, picnic sites and adjacent walks. Dustin Redd is envisioned to be a community-based playground rather than regional destination. Building upon 2018 City Park Master Plan Update outreach initiatives, continued discussions with the community will inform playground features and design. Play and picnic will remain in the meadow it is today and will be comparable in size and scale to the existing footprint. The footprint’s location and configuration may shift to enhance relationships between picnic sites, play features and site features (trees, views, adjacencies) and ensure accessibility for all users and adequate buffers from vehicular circulation. South Meadow concept design will further refine the 2018 City Park Master Plan Update vision for the South Meadow. The master plan established a vision for a variety of linked spaces in City Park’s southeastern corner, including the forested groves, south meadow, Box Canyon, DeBoer Waterway, Pinetum and Lily Pond. During the summer and fall of 2018, there will be open houses and we will be in the park conducting surveys and hosting pop-up events to ensure we engage everyday playground users. Additionally, there will be online surveys and project updates at www.denvergov.org/ParkProjects. I LOVE Dustin Redd Playground! Why is it being replaced? DPR recognizes that Dustin Redd is a special part of City Park and frequently hears that park users love the playground’s scale, setting within the meadow’s tree canopy and aesthetic. Unfortunately, this well-loved playground is showing signs of wear. The playground’s condition and associated safety concerns and operational demands warrant complete replacement. In November 2017, voters approved the Elevate Denver Bond package which allocated funds for design and construction of Dustin Redd. Construction is anticipated to begin in early 2020. 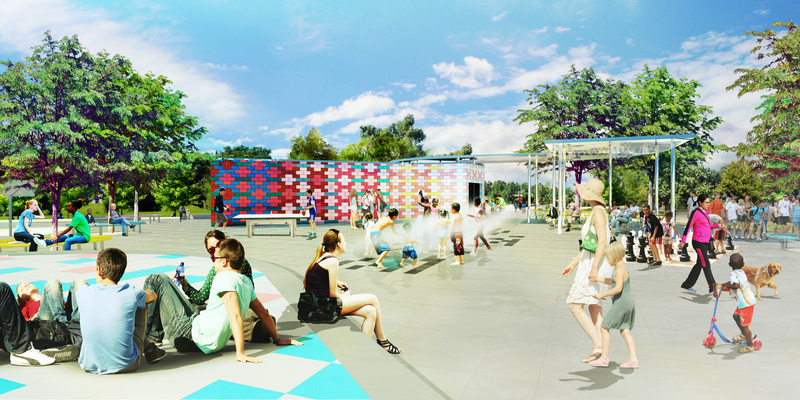 Congress Park Pool was selected to be a project on the Elevate Denver Bond list, which was approved by voters in 2017. This pool is one of the city's oldest and has grown increasingly costly to maintain, requiring extensive upgrades. The Congress Park Pool will be open the summer of 2019 with construction beginning 2020. Get the latest news on projects financed by the Elevate Denver General Obligation (GO) Bond. Phase 1 Construction which included areas outside the floodplain began in mid-June 2018. Check out a time-lapse video of work completed June-December 2018. All permits and Federal Emergency Management Agency (FEMA) approval required for construction work in the floodplain areas were received in January 2019 and Phase 2 construction in areas within floodplain will begin in February 2019. Overall construction is estimated to be complete by mid-late 2019. Phase 1 Construction includes areas outside the floodplain and on site work began in mid-June 2018. Phase 2 Construction includes areas within floodplain and will begin after Federal Emergency Management Agency (FEMA) approval is received. We anticipate receiving FEMA approval in late 2018/early 2019. Overall construction for Phases 1 and 2 is estimated to be complete by mid-late 2019. The re-vegetation and landscape establishment is anticipated to take an additional 2-3 years. Phase 1 construction is scheduled to begin at Harvey Park on or near November 26, 2018, depending on weather. Preparations for this work include lowering the level of the park's lake, beginning the week of November 5. Phase 1 consists of constructing new pump station infrastructure for the irrigation system and other outlet components for Harvey Park Lake. This multi-phase project is scheduled to be complete February 2020 and includes the conversion of Harvey Park's irrigation system to raw water, aligining with the department and city's sustainability goals. Inspiration Point Park is a 25.5 acre Community Park in northwest Denver with over 5 acres of Designated Natural Area. The hillside park features mostly passive uses and is noted for its landscape character of bluegrass upland forest and mixed-grass prairie with expansive views of the Front Range. The Inspiration Point neighborhood is bounded by I-70, Sheridan and I-76 leaving few means for accessible play options within a neighborhood walking distance. In November 2017 voters approved the General Oblication Bond (Elevate Denver) which allocated $2,135,000 for Inspiration Point Park improvements, which may include a new playground, picnic sites, shade shelter and restoration of the historic masonry wall at the point. Denver Parks and Recreation (DPR) has allocated additional funding to initiate a Phase 1 – Discovery, Outreach and Concept Design, which is scheduled to be complete late 2018 with the deliverable goal of a preferred concept plan to help support the selection of the bond project for the second issuance (anticipated for mid-2019). Should the project be selected in the second bond issuance, Phase 2 will begin: Construction Documentation. Any future work beyond Phase 1 is not guaranteed and will be determined as issuances of funding are made available through the General Obligation Bonds (Elevate Denver). DPR and Mundus Bishop will attend the Inspiration Point Registered Neighborhood Organization (RNO) October meeting to discuss preferred concept plans which were developed based on community feedback. View the presenation (PDF) Take the survey! The design consultant, Mundus Bishop, lead a presentation documenting findings from discovery and outreach efforts, along with design concepts, upon which the community provided feedback. The consultant team attended the neighborhood BBQ to initiate outreach for the project by gathering feedback on current use. Beginning August 1, DPR will take over the management and operations of the Johnson Recreation Center. This means that DPR will be responsible for upgrades and maintenance for this building and will provide some recreational programs. Specifically, DPR will begin to provide MY Denver programming for youth, MY Denver PRIME and Active Older Adults programming, the Healthy Meals program, desired youth sports with DPR, and will ensure that Rocky Mountain SER Head Start remains. DPR will work vigorously to ensure that there will not be a gap in programming. To supplement programming offered by DPR at Johnson Recreation Center, community organizations can apply to become program partners. We heard a lot about how important current organizations in the area are to this community. This means that rather than undergoing an extensive Request for Proposals (RFP) as originally discussed at the public meetings, interested organizations, including the Colorado Miners, can simply apply to be a DPR partner. This provides community organizations an easier application process and DPR the ability to respond more nimbly to community needs and interests for this space and the opportunity to partner with organizations that are already active in the neighborhood that need a place to offer classes. DPR will also make sure that services offered at Swansea Recreation Center and by our new (soon to be announced) partner at the Globeville Recreation Center, are not duplicated and are working together whenever possible. Finally, thanks to a generous sponsorship, 90% of all programming fees/league costs/membership costs for those living in the 80216-zip code, will be covered! The 90% discount will be provided with proof of residence of an 80216-zip code (no additional requirements). This will be promoted at an upcoming Open House at the end of the summer, but if you have questions now, please email parksandrecreation@denvergov.org. DPR will host an Open House Celebration for Johnson Recreation Center! An invitation will be sent out separately with details. With fun activities for the whole family, you can stop by to learn more about what programs DPR will offer, what programming needs that were identified by the community remain, and how to become a potential partner. If you would like to be involved in the planning of this event, please email parksandrecreation@denvergov.org. If you are interested in becoming a partner to offer programs at Johnson Recreation Center, apply at any time. If you want to share your ideas about community needs for this center, please email laura.morales@denvergov.org or stop by the Open House event. DPR will use information from previous meetings, the open house, surveys and various community assessments/reports, to help initialize the programming offered at Johnson Recreation Center. We look forward to working with you to continue to make Johnson Recreation Center a hub for the neighborhood that promotes health and wellness, active lifestyles, and builds stronger communities. Denver Parks and Recreation (DPR) is collaborating with The Trust For Public Land (TPL) and Cool Connected Westwood on this pocket park project that will convert an old Xcel Energy substation into a park geared toward children ages 10 and up. The proposed pocket park is located on the corner of Kentucky Avenue and Irving Street in the Westwood neighborhood. 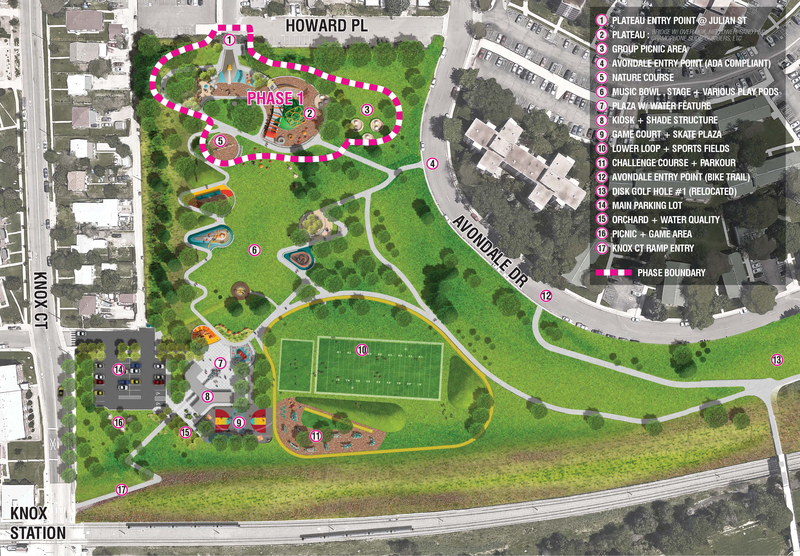 Skate features, climbing features, and art that celebrates Westwood’s culture, are all ideas that have been identified as potential park features in accordance with community feedback. While the park will be designed as a comfortable and welcoming space for all ages, the community wants to ensure that this park serves older children who do not currently have a park that meets their unique needs and desires. This project also lines up the city’s Westwood Via Verde project. Via Verde will be a loop around the entire Westwood neighborhood that promotes safe access for pedestrians, bikers, and automobiles. The intersection of Kentucky Ave. and Irving St. will become a part of a pedestrian greenway, dramatically improving safe access in the future. Many of the outreach events are in collaboration with this project. Denver Parks and Recreation (DPR) está colaborando con The Trust For Public Land (TPL) y Cool Connected Westwood en este proyecto de miniparque que convertirá una antigua subestación de Xcel Energy en un parque dirigido a niños de 10 años en adelante. El miniparque propuesto se encuentra en la esquina de Kentucky Avenue e Irving Street en el vecindario de Westwood. Las características de patinaje, características de escalada y arte que celebra la cultura de Westwood son ideas que se han identificado como características potenciales del miniparque de acuerdo con los comentarios de la comunidad. Mientras el parque se diseñará como un espacio cómodo y acogedor para todas las edades, la comunidad quiere asegurarse de que este parque sirva a niños mayores que actualmente no tienen un parque que satisfaga sus necesidades y deseos únicos. Este proyecto también se alinea con el proyecto Westwood Vía Verde de la Ciudad. Via Verde será un circuito alrededor de todo el vecindario de Westwood que promueve el acceso seguro para peatones, ciclistas y automóviles. La intersección de la avenida Kentucky. e Irving St. se convertirá en parte de una vía verde peatonal, mejorando dramáticamente el acceso y seguridad en el futuro. Muchos de los eventos de divulgación están en colaboración con este proyecto. Renovation area is in front of the neighborhood signs and includes re-grading, irrigation modifications, pollinator-friendly plants and flowering perennials. Turf and tree areas behind the neighborhood signs will be over-seeded to achieve better turf coverage. Hampden & Dayton: July 2018- juniper removal begins. Beginning Oct. 1, 2018: In keeping with sustainability and water use goals, Denver Parks & Recreation is moving forward with median renovations on Evans Avenue between University Blvd. & Fillmore St. The project is anticipated to be complete late spring 2019. Read the groundbreaking press release. May 2018 Update: The "mic tower" is constructed along with many of the other featueres. Phase 1 is scheduled to be complete June 18. View the invitation! February 7, 2018 update: A majority of the walls and grading are complete, and sidewalks are being placed. Construction on the slide begins next week (2/12/18) and play equipment is scheduled to be installed mid-March through April. On June 22, 2017 a public meeting was held to discuss the potential re-use of the two existing buildings on the River North Park site. The process to identify funding and potential partnerships for programming the buildings is underway. River North Park will sit along the Promenade at 35th Street. Creating a community with a focus on the South Platte River is a unique opportunity in northern Denver. The concept design for the River North Park is an opportunity to showcase this unique part of Denver and create a recreational focal point for this area. This park and associated improvements are a critical entry point to the South Platte River Greenway. Construction Notice: Work on the soft-surface loop trail will begin Monday, November 12. This project is currently out to bid with DPR on-call contractors. Construction is anticipated to begin December 2018. Denver Parks and Recreation, in partnership with Dig Studio, is in the process of designing a soft surface loop trail around Sloan’s Lake. As population densities around the park continue to increase, so does park usage. The new trail will connect various portions of existing walks, link park amenities, formalize connections between miscellaneous trails, and reduce congestion on existing park walks. Design is slated for completion in Fall 2018 with construction beginning in Winter 2018. Central Park and Greenway Park playgrounds are in need of restoration and improvement. The new conceptual design will propose opportunities for redesign for both parks, issued in response to the growing Denver and Stapleton populations, material lifecycles, and the impacts that park users have had on the sites. 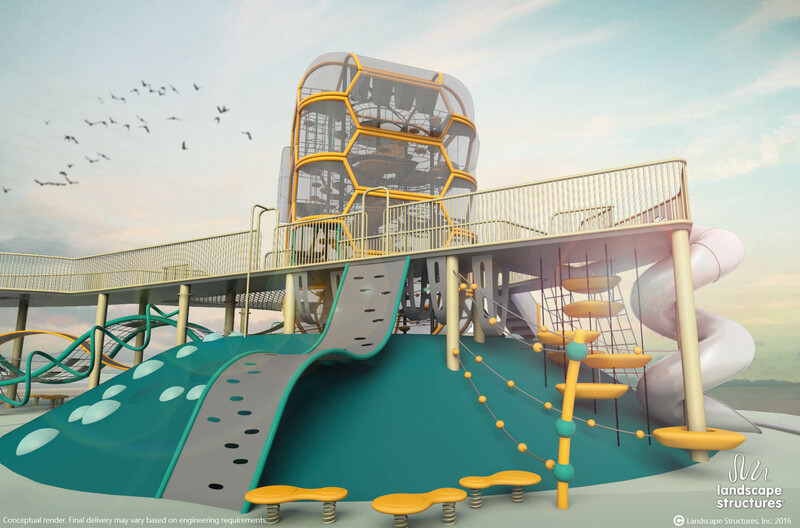 The playgrounds have some existing play elements that are well suited for the sites and in good condition, while other items need redesign, new concept and function. The goal is to identify the need of restoration as well as recommend opportunities for adding capacity and enhancing play value that will complement the existing facilities and site. Located within the 76.1 acre park, Central Park Playground is one of the most visited play areas in Northeast Denver. Located off Martin Luther King Boulevard near Xenia Street, the playground encompasses an eclectic array of site elements including: poured in place play surface mounds, synthetic turf, site furnishings, sand play, a climbing wall and associated play equipment. The artificial rockwork with slide and misting area is also located within the 0.9 acre playground, and the entire area is surrounded by mature trees with a landscape character of native grass prairie and blue grass field open space. The Greenway Playground clusters, located by the picnic shelter, is suggested to include nature play elements that respond to the topography and lower areas that can accommodate occasional flooding that occurs in that area. 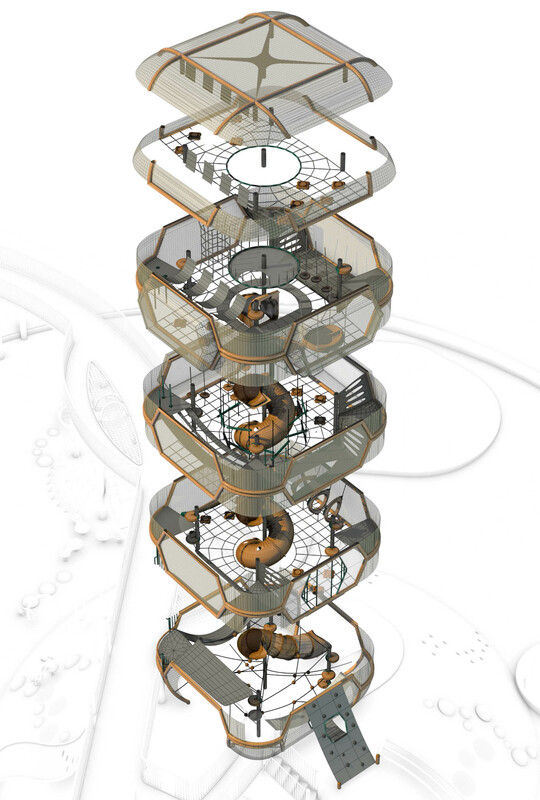 Denver Parks and Recreation (DPR) has allocated CIP funding for the Concept Design will include: Discovery, Outreach and Concept Design for both Stapleton Central Park and Greenway Playgrounds which is scheduled to be completed early Summer 2019. Funding is also available for construction documentation design and construction for the Central Park Playground Renovation only. During winter of 2018, a survey and a discovery session occurred to understand what the community likes about the existing playground and what needs to be updated. This information will be compiled to use in developing concepts of the playgrounds. The next public meeting will be scheduled in mid-March to review results of public outreach and concept designs of both playgrounds. The dates of these events will be shared as soon as they are scheduled. St. Charles Recreation Center and INDUSTRY shared a vision to integrate the spaces between the two properties, envisioning an “Open Campus” to share among neighbors. The idea hopes to connect the outdoor spaces through creative design and an inviting sense of continuity. With some improvements made to the St. Charles outdoor facility, the space can be better activated, inviting all members of the community to move freely between the properties. The partnership understood that in order to be successful, any plans born must develop from ongoing collaboration with not only Denver Parks and Recreation but also more importantly, the Cole community itself. It remains an overarching intent to break down the barriers that exist between new development in the neighborhood, and the actual families that live and inhabit it - for the new employees of INDUSTRY’s 800 person office-sharing complex to assimilate into the community, and harmonize with the existing values present within the neighborhood. View photos from the first public meeting held February 27, 2018. Join the St. Charles Ambassadors at St. Charles Place Park for the unveiling of the preliminary park concept design! This will be our follow-up gathering from the initial community meeting and the ambassadors are in need of the community’s valuable input. Please come and bring your family. This is a great opportunity to see the vision for our newly updated park, to voice your thoughts, to learn more about the schedule of the project, and to meet your neighbors. WHEN: Saturday, June 2, 2018 | 5:30p.m. – 8:00p.m. Sign language interpretation (CART) provided upon request with three business days’ notice: email SignLanguageServices@denvergov.org. ¡Acompaña a los embajadores del St. Charles en el parque St. Charles Place para la develación del concepto preliminar del diseño del parque! Esta será nuestra reunión de seguimiento después de la primera reunión comunitaria y los embajadores necesitan el valioso aporte de la comunidad. Por favor ven y trae a tu familia. ¡Esta es una gran oportunidad de ver la visión del nuevo parque, expresar tus ideas, enterarte más sobre la cronología del programa, y conocer a tus vecinos! ¿CUÁNDO? Sábado, 2 de junio | 5:30p.m. ¡Exhibición de juegos en la naturaleza! Suministramos interpretación de lenguaje de señas (CART) por medio de solicitud con por lo menos 3 (tres) días hábiles de anticipación: envíe correo electrónico a SignLanguageServices@denvergov.org. Por favor comunique otras solicitudes de adaptación del acceso público a DisabilityAccess@denvergov.org. Denver Parks and Recreation will begin restoration and repair of the southern portion of Sullivan Gateway beginning Monday, April 18 as part of a multi-phased enhancement to the City Park Esplanade. Sullivan Gateway, built in 1917, marks the south entry of the City Park Esplanade, part of the City Beautiful Parkway Historic District. The restoration of the terracotta walls and lion-head fountains begins the restoration of an important architectural feature of the City Park Esplanade. The first phase implementation includes refurbishing both the east and west lion head fountains to include new mechanical and electrical work for operation and rehabilitation of the historical terracotta wall adjacent to the fountains. Future phases will include the restoration of the remaining terracotta crescent walls on both the east and west side and associated landscape improvements to the area. The work area site will be fenced off early next week with project completion anticipated by fall of this year. The Sullivan Gateway Phase 1 project work was paid for in part by a $200K History Colorado – State Historical Fund Grant and Denver Parks and Recreation Capital Improvement Fund. For more information about this project, contact courtney.levingston@denvergov.org. In the early 20th century, the national “City Beautiful” movement, inspired by Chicago’s 1893 World’s Fair, aimed to elevate the human spirit by making communities aesthetically attractive by building parks, planting greenery, adding sidewalks and paving streets. Denver Mayor Robert Speer, elected in 1904, was an enthusiastic supporter of the City Beautiful movement, and he became the driving force behind the creation of Civic Center and other areas identified for Denver’s City Beautiful master plan. After the turn-of-the-century, the park benefitted from the city’s investment in the City Beautiful concept. The park was linked, as originally envisioned, to a wider system of parks using parkways and grand boulevards. During this period, monumental sculpture was also introduced, consistent with City Beautiful philosophy, including the McLellan Gateway, the Sopris Gateway, the Monti Gateway, the Sullivan Gateway, and the Thatcher Memorial Fountain, which mark park entrances. Thank you to all who came out to celebrate the opening of the new Washington Park regional playground! As envisioned by the 2011 Washington Park Master Plan, this new playground replaces the north playground by the boathouse as the regional playground for the area. Beginning next month, the north playground will be removed, as the wooden structure is past its useful life and poses safety concerns, such as splinters, for children playing on it. Demolition of the north playground is scheduled to begin on Monday, September 17, 2018. Denver Parks and Recreation (DPR) will conduct a public process with the neighborhood starting in late 2018, to discuss design ideas to re-envision this space based on the park’s master plan. We look forward to working with the community to discuss ideas for this area. Stay tuned for public outreach details! Beginning Monday, July 2, courts 7 & 8 in Washington Park will be closed for resurfacing, with the closure ofcourts 1-5 following about one (1) week later. Thereafter, ALL of the courts on the south end of WashingtonPark will remain closed until work is complete on August 31. The playground located at the end of the diagonal road (east of Tennessee & Downing) is being replaced. The construction period is expected to last until August 1, 2018, unless severe weather causes delays. The playground will be closed throughout construction. Denver Parks and Recreation will continue to assess and review the loop road configuration in the 2018 season to ensure that it is working for all modes of travel. As always, staff welcomes observations and constructive feedback from the public on how their visitor experience can be improved. Please email parksandrecreation@denvergov.org or call (720) 913-1311 to provide additional comments on the loop road. Improvements are complete and the park is fully open to the public! Project is approx. 70% complete- concrete plaza has been poured and other plaza features are complete. The shelter frame has been and the pollinator garden near the outdoor classroom has been planted! The water feature and sand play area are also progressing. In the coming weeks, swings will be installed along with sod installation at the Kentucky and Wolff entrances. The project is about 50% complete with the majority of the playground equipment installed including, all of the Nature Play elements. The tree material used for the nature play was not from trees taken down at Westwood Park. The tree material was salvaged from another site that was removing the trees for other work. The installation of the fitness equipment around the loop walk will continue into June. In the coming weeks the shelter will be constructed with the seat walls and picnic sites. The water play cobble channel and sand play will also be formed and poured. Construction on Westwood Park will begin mid-January and is anticipated to be complete later this year in summer/early fall 2018. Download the sign posted on-site that includes a diagram of the upgrades that will be made to the park. This project is partnership with The Trust for Public Land, Healthy Places and Westwood Unidos. Thank you for your support! Denver Parks & Recreation Department, in partnership with The Trust For Public Land, Healthy Places and Westwood Unidos, is in the process of conceptual planning of Westwood Park in preparation for replacing the existing playground, walks and adding new fitness equipment. A public outreach and input process is underway with design expected to be complete by the end of 2015. Construction is tentatively scheduled to begin in spring 2016. For questions or comments please contact Project Manager, Owen Snell. If you are unable to access content in the documents linked on this page, please send an email to our planning team (or parksandrecreation@denvergov.org) to be connected to another resource. With 50,000 registered dogs & counting in Denver, public input is needed to define the needs and priorities for current and future dog parks. The Master Plan for Denver's historic City Park is due for an update and we need your input! The 20-year plan will focus on enhancing quality of life in the downtown area through investment in parks and public spaces.